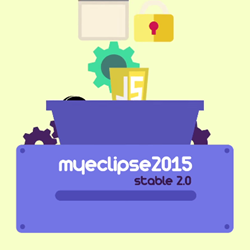 Genuitec has released the latest 2015 update, MyEclipse 2015 Stable 2.0. While the newest feature set focuses on web and mobile development, the core Java EE features of MyEclipse continue to be maintained and improved. We want to give the enterprise developer tools relevant to any project, whether it’s a traditional Java EE desktop application, web front or back-end, or mobile project. To further increase productivity, the integration of Emmet decreases the amount of time required to type HTML, CSS, and XML by allowing coders to type short expressions that are then parsed and expanded. The breadth of capabilities allow enterprise developers to tackle the variety of development requirements of their organization. 2015 Stable 2.0 is based on the newer Eclipse Luna SR 2 (4.4.2) release and includes updates to popular tooling such as EGit and Mylyn. With the Ionic framework gaining popularity for web and mobile UI development, Genuitec has made access to this technology easier by offering Ionic templates as a starting point for PhoneGap mobile apps. In addition, an Ionic widget palette has found a place beside the JQuery palette in the MyEclipse web designer. The drag and drop function of the palette simplifies addition of Ionic, JQuery, HTML and other UI elements. To purchase MyEclipse 2015 Stable 2.0 and learn more about all the exciting features MyEclipse 2015 Stable 2.0 has to offer, visit: https://www.genuitec.com/products/myeclipse/features/me2015/. Started in 1997 and counting over 16,000 companies in 191 countries as customers, Genuitec is a leader in the Eclipse open source community. As a founding member of the Eclipse Foundation, Genuitec has actively participated in strategy, development, and direction for the organization. Today, Genuitec supports one of the largest developer communities for commercial Eclipse tools. Customers benefit from Genuitec’s ongoing commitment to open standards and to the continual enhancement of the MyEclipse, Secure Delivery Center, and Mobile Tools product families with unique innovations and low subscription pricing.